Not sure how my story began. I know I must have had a home and family, they say I am too sweet to not have experienced all the things that cats need. At some point in the past year or so things changed – a lot. I found myself at Animal Care and Control Centre in Edmonton. From here on, I remember almost everything. I was checked and put in a cage. 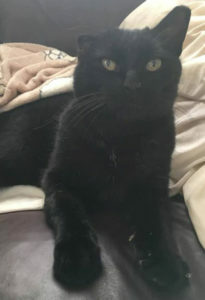 I didn’t have a microchip so I was put on a 72 hour hold and I was shown on their lost pet page, as a domestic short hair black male cat about 6 years old. No one came for me, I don’t know why. A lady from IWARS happened to be at ACCC to take a cat that was in a cage next to me. I was brought to her attention, ACCC said my hold was up and I could be transferred to them… One thing though, I had what they called “cauliflower ear”. IWARS asked if I was okay and what that meant. The outer ear was folded over and looked crumpled, and part of it was thick. However, at this point it seemed it was stable, but they recommended a thorough check be done down the road if I was transferred. Realizing that this was my chance, I put on the charm, and, I am happy to say, IT WORKED!! One thing about being so close to my foster mama, she started to smell something odd… coming from me, NO not from there, from my ear! Things were not getting better so off to the vet we went. This time I had a temperature, and some (okay, that means a lot!) of not good stuff coming from my ear. This was not something they could not deal with, especially if surgery was needed, so I was referred to a specialist. 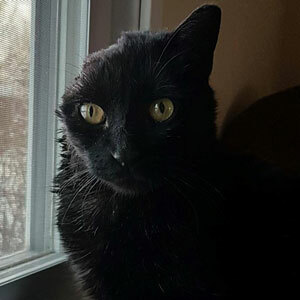 The vet recommended surgery to clear out the debris likely from repeated infections, and to allow the ear to drain, as it couldn’t naturally do so now. My first foster was not able to deal with post op care, so I was transferred to another foster home, it was great too, although a few more cats than was I was used to, and I needed to clarify that I was the man of the house, so to speak, but more kiddos around and plenty of laps to sit on and hands to pet! The day finally came, time for surgery. Oh my, it was far worse than they expected. There was a lot of debris and damage. The outer ear had to be removed, but at this point the inner ear could be saved, hopefully with hearing intact. Now it was time for recovery. I stayed at the vet for quite a while, there was not enough skin to cover the whole wound so it was a bit tricky at first. Stitches had to be redone once, but that part was pretty vague, I was on pain meds, AND I was receiving so much love from the staff – I think I stayed there longer cause they didn’t want to let me go, but we’ll just keep that between us!! The day finally came and it was time to go back home. Lots of TLC, meds and monitoring and in no time, I was healing. Yes there were a couple blips in my recovery that were resolved by a visit to the vet and then one day, the vet deemed me healed! Next on the list of things to do? Find my own forever family!! I am happy to report on December 21st, I got my family, I was going to be home for the holidays! !